1) What is Amulet Scout? If you're totally new to this deck architype, first check the 2nd post by Izzetmage (old primer), that has a bit more detail around what this deck is. This version, simply, is an effort by many people to make a banned deck playable. Sakura-tribe Scout fills the role of summer bloom, though poorly! There's more to it than that, so read on! Why should you play Amulet Scout? 1) The big reason people will play this, is that they loved Amulet Bloom in the beginning. If you enjoy this deck, then you should play it, because it's still competitive. 2) Currently the deck is well positioned, as Tron is at an all time low - making land destruction less prevelant. The best way to beat this deck is to attack its manabase, and people aren't doing that at the minute. Obviously this will not always be the case, but there are ways to beat a simple ghost quarter! 3) The deck prays on control and midrange strategies. It's quicker and bigger, and has a better late game than them. If you like to beat up on those types of decks, this is the way to do it! Why should you NOT play Amulet Scout? 1) It requires practice. The original deck was complicaited, and if anything, this is harder still. There's less free wins, so you naturally have longer games, which takes more skill than previous. 2) If you want to feel like you're doing something completely broken, this is probably not for you. The deck is much fairer than its predecessor. If you want to feel invincible for a round or 2, you probably want to play something else (like storm). 3) It’s vulnerable to land hate and tutor hate. Blood Moon is almost unbeatable, and land destruction like Fulminator Mage or Ghost Quarter on one of your bouncelands sets your tempo back by a large margin. This deck also searches for things a lot (Summoner’s Pact, Primeval Titan), so search hate like Aven Mindcensor can throw a wrench in your plans. When looking at these lists, there’s usually 2-3 flex slots main, and perhaps 4-5 lands that can be interchangeable. Tireless Tracker – this card is great in grindy metas, and can act as a wincon (if you don’t draw a primeval titan, this card can help you find him, whilst also growing quickly – especially if you have azusa in play). It’s poor vs combo or decks like affinity that can ignore him, and isn’t particularly impressive on the defensive, but is an impressive value engine. Courser of Kruphix – Courser is a lot less popular these days, as he has several downsides. First, is that his card type enchantment does not line up well against destructive revelry in burn or against junds tarmogoyf. Second, the double-green requirement on turns 2-3 can be difficult. And third, his power level just isn’t the same as trackers. HOWEVER, Courser comes with the upside of being relevant in almost every match-up. He blocks pretty well against agro decks, gives value vs midrange, gains life against burn, and digs deeper against combo (though this is clearly where he is weakest). Courser is probably best in a wide-open meta that you have no clue about. Relic of Progenitus – this card gets run for 2 simple reasons. 1. When it’s bad, it draws you a card, and 2. When its good, you can sometimes find it off ancient stirrings. There’s not much to say about relic past that. Jace, the Mind Sculptor – untested by yours truly, but theoretically this card fills a similar role to tireless tracker. It won’t be stunning when you have no board and are behind, though the brainstorm mode or bounce a creature mode will likely be better than trackers chump block mode. However, Jace has the potential to both take over the game and fix your draws, making it another must-answer threat and a good utility card. The main negative points against jace are 1) doesn’t help you in the faster match-ups and 2) you need to tweak the manabase to help cast her on time. Hornet Queen – a fun-of tutorable target that helps sure up your midrange and affinity matches, hornet queen usually hangs out in the sideboard due to its high casting cost. However, there’s a low cost to including her in the main, and a potentially high payoff. Simian Spirit Guide – clearly the little ape is a ramp spell, but it helps get you to 6 in the games where that’s important. Not tutorable, and terrible topdeck go against SSG, but it’s ability to ramp can be the difference in the faster matches. Walking Ballista – considered more stock than flex, ballista’s own flexibility whilst being tutorable off t-west AND stirrings, makes ballista a strong inclusion. In the late game, it’s a wincon and in the early game it can be disruptive. The main negative against ballista is that it’s not so exciting in your opener, and can be a blank in some match-ups such as spell-based combo and tron/valakut. Dismember – not much to say on ‘dis, but the fact that it’s a live card most of the time and is early enough to matter (and easy to cast) make it a reasonable inclusion. Primal Command – this card fills the gap between 5 and 6 mana by disrupting the opponent, and having enough flexibility to be relevant against most decks (e.g. top a land and shuffle is great vs tron, shuffle and gain 7 great vs dredge, search and shuffle own GY great vs control etc). However, it’s a clunky card and has no real synergy with the rest of whats going on. Obstinate Baloth / Thragtusk – not completely crazy to include these main since they see a lot of sideboard play, but they’re very specific in what they are doing. If you KNOW you want the lifegain % the value for your meta, then go ahead and run them. 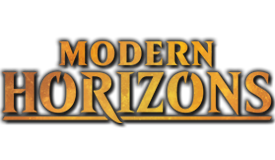 But remember modern is such a wide format and often these will be blank. Hive Mind – more suited to Puntthenwhine’s lotus bloom list, but sees play here and there. The issue with Hive Mind is that it’s a 2 card combo in a deck trying to make 6 land drops, so its hard to get everything to line up. In addition to that, the combo comes down slower than the summer bloom days, so it’s easier for opponents to get to 4 mana for the summoner’s pact etc. Once this becomes a 3-card combo, it’s inclusion is just not worthwhile. Sakura-tribe Elder – this guy chumps and ramps, which has a similar yet different value to Explore. It’s better when you have planeswalkers you want to protect. Powerlevel is low but its efficient. Saheeli Rai – this is a bit of a spicy card that hasn’t seen much play, but has some potential. Its poor when behind on board, but it can copy a Sakura-tribe Elder to ramp, an Amulet to go crazy or a primeval titan to make some really crazy lines (e.g. play titan with no amulet, get 2 lands, copy titan, get 2 more lands, attack with new titan, get 2 more lands). Its powerlevel is high but its consistency (and ease to cast) are both low. How many blue sources and/or red sources do you need? Are you playing Jace? How many sweepers are in your sideboard? Are you expecting death’s shadow, tron, dredge/storm, UW Control? Do you expect to play against a lot of path to exiles, field of ruin or ghost quarters? 2-4 Basics (usually forests, but if Sakura Tribe Elder is involved, you may want an island). 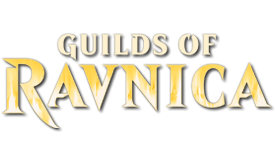 0-3 Grove of the Burnwillows – just for Deaths Shadow! 1 Bojuka Bog, Ghost Quarter, Cavern of Souls – these cards are for specific decks, though have some utility elsewhere for the most part. Depending on your other flex slots, you may have to choose 1-2 of these to NOT include. Please read Izzetmages “old primer” for a lot of the basics regarding sequencing and the different combos in the deck. A lot of that still holds true today. The only new “trick” that is relevant today that wasn’t before uses sakura-tribe scout. This guy allows you to play lands at instant speed. This is extremely relevant. First of all, you can decide which land you’ll need based on what the opponent does. For example, if you have a Radiant Fountain AND Khalni Garden in hand, which should you run out? Well, that depends on your life total and what your opponent attacks you with. If you don’t have to put that land into play now, wait until they declare attackers and make a decision then. More importantly though – a bounceland in hand + a scout allows you to protect your lands from an incoming fulminator mage, spreading seas or ghost quarter. Copying an opponents island whilst a blood moon is in play, cast Hive Mind and a pact and win. Copy an opponents Celestial Colonnade to create a threat, that is usually larger than theirs (thanks to slayers’ stronghold). Copy an opponents shockland on T1 so that you can untap with either G or U that you need to cast your various 1-drops. Copy an opponents tapped ghost quarter (with amulet in play), it untaps and blows up their ghost quarter before they can use it. A similar line, but when you have no amulet in play and landing a titan - fetch Vesuva to copy your own tapped ghost quarter and a bounceland to return the ghost quarter to hand. Play GQ and use it, to blow up a tron piece, and still have a spare ghost quarter left behind! It also copies Radiant Fountain / Khalni Garden to make more life/tokens, or copies a bounceland to either return a key land back to hand (tolaria west) or to “combo” with an azusa + amulet on board. I will come back to this section shortly to discuss what I get asked most about – mulligans and sideboarding! So, I’ll concentrate on point 3 here, starting with an example. Gx Tron is a fairly close match-up, but can be won or lost on a few small points. The dice roll 100% matters in this match, as do points 1 and 2. If Tron lands a T3 Karn on the play, you’re unlikely to beat it. If you land a turn 3 titan, they’re unlikely to beat it. The difference between this being favourable and being unfavourable is the number of Ghost Quarters in your deck. If you have 1 main and 1 side, this is likely a good match-up. If you have 0 copies main and 1 side, it’s likely a tough match-up. If you have 1 main 0 side, it’s pretty close to 50/50. You can apply this theory to a whole host of decks, such as Dredge (Bog / relic), RG Valakut, and UW Control (cavern). Outside of that, you can impact your matches with your sideboard choices such as Hornet Queen (Affinity, Jund), Ruric Thar/Tormod’s Crypt (Storm), and Kozileks Return (Affinity). So, lets discuss the matches that are not particularly close. I never consider any matches unwinnable or a walk-over, so don’t consider this “You’ll never beat X” – just that you’re behind when you shuffle up. 1. Humans – this deck represents a fast clock and disruption. It’s the perfect recipe to beat us. 2. RG Ponza – this deck was always fairly tough, but felt much more winnable before BBE turned up. That card has created disruption AND a clock, and the fact they’re a 4-of blood moon deck makes this really rough. 3. UW Control – this is a very skill intensive match, and can very easily go either way. However, we are favourites. Small deck building choices and small decisions during the game make a big difference here, but UW Control is typically a match I want to play rather than avoid. 4. Merfolk – the disruption is sorcery speed (spreading seas) and the clock is medium – and they get blown out by EE. It’s a very favourable match-up. 6. Death & Taxes (Eldrazi addition) – this deck has a clock and the disruption is fairly brutal for us. Where Leonin Arbiter and Ghost Quarter are usually seen as a good combo, both cards are individually strong even if they don’t line up against us. Add in Displacer + Thought-knot which present a real clock, and you can see why this is a tough 1. You have to lean on your sideboard creature kill to remove the clock and disruption. Once you resolve a titan, you’re a strong favourite, but it’s getting to that point with enough life to survive that’s the tricky bit. Rather than post a bunch on decklists, it’s time for some links again! There’s more content out there, but much of it is old. Jeff Hoogland has played it on his channel for example, but it’s a few months ago now. You'll have a bounce trigger, and 4 amulet triggers all "waiting" to go on the stack. When you hover your mouse over these amulet triggers, the land that it refers to will grow a little on your battlefield. So, if the far left amulet trigger is slayers', then all is well and you can just click on your bounce trigger and they'll line up right. If the far left is boros garrison though, then you need to be a little clever. You go and click both slayers' stronghold trigger first, then the bounceland trigger, then the boros untaps will happen. The downside of this is that you cannot pick up the slayers', because its untapping after the bounce trigger. But, it means you can double-haste, which is often more important (when you're taking this line, you're killing the opp 9 times out of 10). I'm going to list SOME of the more expensive cards, and discuss options to replace them. Note that all these changes will make the deck worse, but effectively play the same with similar match-ups. Obviously MTGO and Paper magic have different values and savings, so you'll have to make those choices yourself. 1. EE - maindeck Slaughter Pact does a good impression of EE, with an upside or 2. First off, tutoring it up and killing something costs 3 mana instead of 6+. It also kills Platinum Angels and EndBringers, titans etc. EE is the better card, but my first 10 matches with Slaughter Pact it came up 0 times, and Pact was better twice. Adjust your bouncelands to include a golgari rot farm if you make this change. 2. Gemstone Mine - I'd never recommend cutting all 4, but you can comfortably cut 1 for a City of Brass or Mana Confluence. I never recommend 2x Pain land because drawing both is really tough, but having a singleton is fine. Aether Hub is also an ok replacement, as is more basics / crumbling vestige. 3. Azusa, Lost but Seeking - currently cheap on MODO, but not necessarily in paper. Journey of Discovery does a 1-time only impression of the card, and Wayward Swordtooth is like Azusa breading with Reality Smasher but is still in child form! The 1st Azusa has infinitely more value than the 2nd/3rd/4th since you can pact it up, so always try get the 1st copy. But if you cut gemstones for more basics, Journey sometimes comes with upside (plus it can't be interrupted by bolt). 4. Cavern of Souls - this card will win you games, and there's no hiding from that unfortunately. However, in the cases where its not crucial, Temple of Mystery is often the better land. In cases where Cavern is key (e.g. slow blue match-ups), Temple can offer some value to try and compensate for the lack of cavern. 5. Summoner's Pact - I've been a little cautious on running all 4 recently, wondering if 3 is the right number. 4 is probably correct, but because its quite close (only in this writers opinion), you could cut a copy for a different threat, whether thats tracker, hornet queen, obstinate baloth etc. You could almost fill the slot with anything in all honesty. 6. Sideboarding - there's not THAT much key stuff in the board, with Hornet Queen and Rec Sage probably the 2 most important cards. Since those are cheap, I wouldn't worry too much about the rest of the slots. Pyroclasm replaces K-return and Baloths can replace Trackers etc. 1) What is Amulet Bloom? 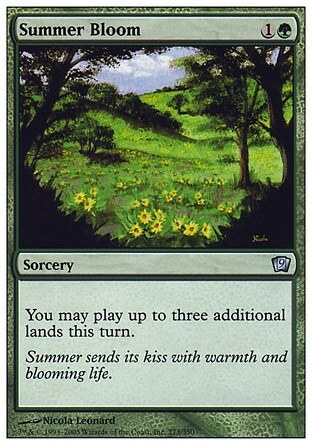 Amulet Bloom is a green-based ramp/combo deck, based upon Amulet of Vigor, Summer Bloom, and the Ravnica bouncelands. Amulet of Vigor removes the ETB tapped drawback of bouncelands, while Summer Bloom allows you to play enough lands to increase your per-turn mana production by 3. Their true power is unleashed when combined, allowing you to ramp into a Primeval Titan as early as turn two. Why should you play Amulet Bloom? 1) It’s resilient. Firstly, your main resource is lands. With some exceptions, lands can’t be burned, killed, countered or discarded. Once you play a land, it’s there to stay. This lets you “combo off” more than once, in case you got disrupted the first time around. Next, your Titans can search up more Titans (this will be explained later). If the first Titan dies, a second will be ready to take its place. Non-combo decks will find it hard to handle Titan after Titan. 2) It has good matchups against creature-based decks. Your creature (Titan) is larger than almost any of theirs, and can’t be killed by a single Bolt. 3) It has two wincons (Primeval Titan and Hive Mind). This isn’t just “cool”; it has some strategic applications too. Why should you NOT play Amulet Bloom? 1) It requires practice. You need to learn to sequence your lands properly when playing this deck. You need to know every card in your deck, the quantities you play them in, and keep track of all that during the game – you don’t want to build your entire plan around, say, casting Primeval Titan and giving it haste with Slayers’ Stronghold, only to realize that the sole copy of Slayers’ Stronghold was in your hand the whole time. 2) It relies on the combat step. While having a creature as a wincon is great for walling attackers, it also opens you up to more ways of getting disrupted: chiefly, a Pestermite/Deceiver Exarch tapping down Titan before combat. The core of the deck. Always play 4 Amulet and 4 Summer Bloom. You will win most of your games with Primeval Titan, so max out on him and Summoner’s Pact. Hive Mind is an alternate wincon. Given that you are already playing 4 Summoner’s Pact, it’s not hard to add a couple more (e.g. 2 Pact of Negation, 1 Slaughter Pact) for utility and the alt-win. These cards provide you with extra land drops or mana, for when you don’t draw Summer Bloom. Azusa is the most powerful out of all of these; you should play at least 3 copies of her. The rest depends on personal preference. I do not recommend Oracle because it costs a lot. Journey of Discovery is a valid budget option if you don't have Azusa. 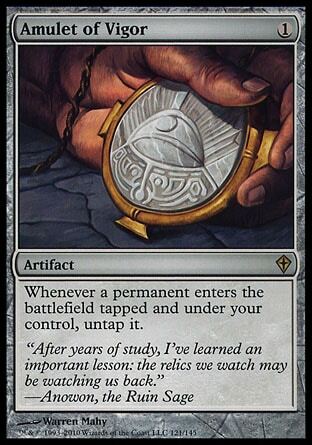 These cards provide ways to dig/tutor for your game-winners, usually Amulet. Summoner’s Pact has already been covered under “Wincons”. I do not recommend Trinket Mage or Wargate because they often come down too late. 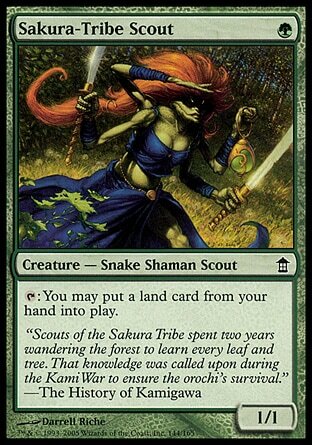 Their main function is to tutor for Amulet, but if you feel like you need more acceleration you should stick to lower-CMC ramp cards like Sakura-Tribe Scout or Explore instead. Running out a ramp spell on turn 1/2 will increase your mana production quicker than what is effectively a 4-mana Amulet. These “pump” lands allow your Primeval Titan to close the game quickly. Slayers’ Stronghold is an absolute necessity, as it grants haste. Helps you stay alive against aggressive strategies. Inkmoth Nexus is better as an alternate wincon, but you need the creature for utility more often than as a wincon, so Khalni Garden is better in general. Helps you dig a little bit deeper. The most versatile land of all. It can ETB as any other land, even your opponent’s (although most of the time your lands are better). 1 is sufficient, as it does nothing by itself. Note that you have to choose a land that’s already on the battlefield for Vesuva to ETB as a copy of it. If you search for two lands with Titan, one of which is Vesuva, it can’t copy the other land. Vesuva copies supertypes too, so if you use Vesuva to copy a basic Island for example, it can't be Tectonic Edged or affected by Blood Moon. Hardcasting Hive Mind (using Vesuva to copy your opponent's basic Island) is an out against UR decks with Blood Moon. Green is the most important color in the deck, hence the basic Forest. Gemstone Mine and Tendo Ice Bridge can be reset with bouncelands, negating their drawbacks. One final note: the total land count for this deck should be 26-29. You can use some sideboard slots for extra HM pieces. Slaughter Pact in particular is good against Twin. 1) Short-term: in conjunction with Amulet of Vigor to generate as much mana as possible in 1 turn. Do this if you know that you have the win in hand and your opponent cannot stop you. 2) Long-term: to put as many lands into play as possible so that you have more mana on future turns. If you’re going for plan 1, you’ll want to play as many bouncelands as possible. Thus, you should use bouncelands’ triggers on themselves after you tap them for mana, so that you can play them again. A single bounceland can generate 6 mana all by itself this way, enough for either of your wincons. If you’re going for plan 2, try to use your bouncelands’ abilities to reset as many Mines, Bridges and ETB-effect lands as possible (including Vesuva). Note that you can also bounce green/blue sources and replay them to cast 1-drops (Serum Visions, Ancient Stirrings). Play bounceland, tap for 1G, return bounceland to hand. Play the land you just returned for 2 more life, or an extra token, or 1 more scry. 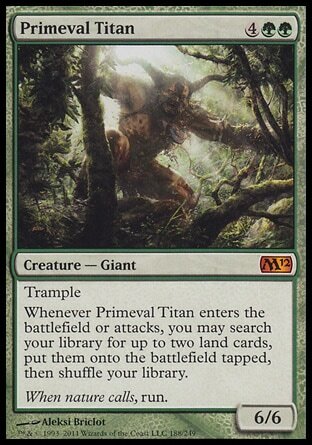 Primeval Titan wins the game…provided you know which lands to search for. The following assumes Amulet on the battlefield. Boros Garrison + Slayers’ Stronghold: The most common search when Titan ETBs. You activate Stronghold, giving Titan haste and grabbing another 2 lands. Simic Growth Chamber + Tolaria West: This lets you tutor up a Pact, be it Negation to protect your Titan or Summoner’s to get another one. You tap both lands for UUG, then bounce Tolaria West with the Growth Chamber’s effect. You can then transmute Tolaria West for the desired Pact. Note that you can only transmute as a sorcery, so you should try to search for these 2 lands upon ETB (instead of when you attack), or if you have enough mana to transmute in the second main phase. You can still search for them otherwise, but it’ll be slower. Radiant Fountain/Khalni Garden + bounceland: If you haven’t played a land this turn, you can get the ETB triggers of Fountain/Garden twice. You tutor it + a bounceland for one trigger, then bounce it and replay it during the main phase. Alternatively, if you have no land drops remaining, you can search for Fountain + Garden for 2 life and a chump blocker. If a Fountain/Garden is already on the battlefield (BEFORE Titan triggered), you can search for Vesuva to copy it. Sunhome, Fortress of the Legion + Vesuva/Boros Garrison: Usually you’ll get this after Garrison + Stronghold, or if you don’t have Amulet. Vesuva comes down copying Garrison, generating the correct colors for Sunhome. 2 Simic Growth Chamber: If you have two mana open and a second Titan in hand, you can get two bouncelands, bringing you to 6 mana, and cast the second Titan. Inkmoth Nexus + Kessig Wolf Run: The old combo from Standard. It gives you an out in case Titan bites it (although if Titan is going to die, you should get Simic Growth Chamber + Tolaria West instead). If you don’t play Inkmoth you can grab Garden. Cast Pacts during your turn, after your upkeep. 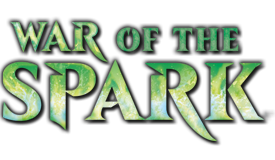 You want your opponent to lose before you do, unless you can pay for the Pact and they can’t (wrong colors for example). Now your opponent can choose whatever target he wants for his Pact copy, but since it resolved, he will get a “lose on upkeep” trigger. Hive Mind shuts down counters. If your opponent casts a counterspell, you get to copy it, and can counter his counter. The exception is Counterflux. 1) Counterflux cannot counter its controller's spells. That means your opponent can't use it to counter his Pact copy. Likewise, you can't use a copied Counterflux to counter your Pacts. 2) While Counterflux can't be countered, it is a valid target for a counterspell. Like, say...a copied Counterflux. If your opponent casts a non-overloaded Counterflux and you copy it due to Hive Mind, you do not have to target his Pact copy - you can target his Counterflux. Yes, it will do nothing, but that is exactly what you want - the alternative is throwing the game away because your opponent didn't have to pay for Pact. Chalice of the Void on 0 doesn’t stop the Hive Mind kill – in fact, it makes things even better for you, because you don’t have to pay. Hive Mind copies Pacts, which Chalice does nothing to stop. If you cast a Pact, your Pact is countered, but your opponent’s copy is not. Note that if the Pact fizzles (i.e. “countered upon resolution”), it does not create a “lose on upkeep” trigger. Once you cast Azusa and it resolves, you gain priority and can play lands. Playing lands is a special action that doesn’t use the stack, so your opponent cannot respond to a land drop with removal. Note that, however, your opponent can respond to triggered abilities (e.g. Garden/Fountain/Temple/bounceland trigger). Whenever possible, play lands with triggered abilities last. Gemstone Mine and Tendo Ice Bridge entering the battlefield with counters are NOT triggered abilities. They are replacement effects. Any time you want to play a land for any reason, if you've used all your land plays for the turn, then you can't play the land. By default, you have one land play on each of your turns. Spells or abilities can add to this number. So can permanents that allow you to play additional lands, but if these permanents leave the battlefield, those additional land plays disappear. As before, you can take a special action once on each of your turns during either main phase to play a land. A spell or ability may also instruct you to play a land as part of its resolution (for example, the activated ability of Djinn of Wishes). No matter how you're playing the land, it uses up a land play. If you're out of unused land plays for a turn, you can't play a land. And just like before, you can never play a land if it isn't your turn. What this means is that if you have Azusa in play, another Azusa in hand, and have used up both your extra land drops for the turn, it does you no good to cast the Azusa in hand. You don’t get to play 2 more lands, in addition to the 2 extra you’ve already played this turn. Resolve one untap trigger, then tap the bounceland for mana. Finally resolve the bounce trigger and return the land of your choice to hand. Remember that the above also applies to fetched utility lands. For example, if you have two Amulets, you can fetch Boros Garrison + Slayers' Stronghold and activate Stronghold twice, for +4/0. If you have two Amulets and fetch Kessig Wolf Run, tap it for 1 after the first untap, then for +X/0 on the second. This gives you an extra point of power. Bouncelands provide 2 mana with Amulet out. This can jump you from 4 to 6 in one turn. Hence, it may be a good idea to keep a bounceland in hand to facilitate those plays when you topdeck a Titan/Hive Mind. For example: if you have 3 lands and an Amulet in play, and have a bounceland and a generic source in hand, play the generic source. On the next turn if you topdeck Titan/Hive Mind/Summoner’s Pact you can slam it down immediately. If you don't have an Amulet, pay attention when you reach 5 mana. You want to have a land in your hand that ETBs untapped so that you can cast a 6-drop if you draw it next turn. T3 Tendo Ice Bridge, cast Azusa. Another Simic Growth Chamber, return Tendo Ice Bridge. At this point, suppose you have the choice of Tendo Ice Bridge and Khalni Garden to play as your final land. Play Garden, so that next turn if you topdeck Titan/Hive Mind/Summoner's Pact you can play it immediately. Sometimes you'll be tempted to play Bridge instead and cast Serum Visions/Ancient Stirrings for value - try not to do this unless you have another land that ETBs untapped in your hand. Here’s how to get the most power out of the three pump lands. “Mana” refers to the total amount of mana you have, including that which the pump lands can produce. Maximizing power is prioritized first, then minimizing mana usage. Here are some sample hands to show what this deck is capable of, and how to play it. The following examples assume no disruption unless stated otherwise. Sample hands are for educational purposes only. Do not assume that this deck consistently draws these kinds of hands! I use Simic Growth Chamber and Primeval Titan in the examples. These can be substituted for any green bounceland and Summoner’s Pact/Hive Mind respectively. If a given hand has fewer than 7 cards, it means that the remaining cards can be anything; they’re not needed for that particular sequence. If a given hand has more than 7 cards, it means that you need to assemble all those cards within the first few draw steps that you get. Key lesson: Maximizing one-turn mana production. Using Vesuva to recover if you’ve already played and tapped a land that is needed later. Gemstone Mine, Amulet of Vigor. Simic Growth Chamber, tap for UG, return itself, Summer Bloom. Simic Growth Chamber, tap for UG, return itself. Simic Growth Chamber, tap for UG, return Mine, Primeval Titan. You can cast Amulet on turn 2 instead. Usually you get into this situation by T1 Mine, Ancient Stirrings finding Amulet. Usually you will search for Boros Garrison + Slayers’ Stronghold, then activate Stronghold and attack for two more lands. Tap Gemstone Mine for G.
Simic Growth Chamber, tap for UG, return Mine. Search for Boros Garrison + Vesuva (copying Slayers’ Stronghold), activate the copied Stronghold and attack with Titan. Key lesson: Maximizing available mana for future turns. Maximizing ETB triggers. Sandbagging ETB-untapped lands at 5 mana without Amulet. Tendo Ice Bridge, Summer Bloom. Simic Growth Chamber, return Khalni Garden. Simic Growth Chamber, return Tendo Ice Bridge. Tendo Ice Bridge, Primeval Titan. Note that if you returned Khalni Garden instead of Tendo Ice Bridge on turn 2, you would be unable to cast Primeval Titan on turn 3. Simic Growth Chamber, return Bridge. Note that you still have 2 land drops with Azusa. Feel free to get bouncelands with Titan, bouncing Khalni Garden, then replay Garden for more tokens! Key lesson: Maximizing available mana for future turns. Using Azusa’s extra land drops to generate mana without Amulet. Tap all lands for 1UUGG. Bouceland, return Tendo Ice Bridge. Tendo Ice Bridge, tap for 1, Primeval Titan. The key lesson here is to use bouncelands and Azusa to replay ETB-untapped lands. This gives you the crucial sixth mana for Titan, something which the topdecked bounceland would be unable to do by itself. Key lesson: Maximizing available mana for future turns. Playing lands with triggered abilities last so that Azusa can’t be killed in response. Sandbagging bouncelands at 4 mana with Amulet. Your opponent has a Lightning Bolt that he will use to kill Azusa when he gains priority. Simic Growth Chamber, tap for UG, return Forest, Azusa. Forest, then Khalni Garden, get token. Opponent kills Azusa in response to Garden’s trigger. Tap all lands for UGGG. Simic Growth Chamber, tap for UG, return anything, Primeval Titan. Note that if you play Forest, then Simic Growth Chamber returning Forest on turn 2 and Azusa gets killed, you would be unable to cast Titan on turn 3. If you try to play Khalni Garden then Forest, your opponent will kill Azusa in response to the trigger and you’d be out of land drops. Key lesson: Maximizing available mana for future turns. Maximizing ETB triggers. Not tapping out before combat. Playing lands in the second main phase. Simic Growth Chamber, tap for UG, return Mine, Azusa. Gemstone Mine, then Khalni Garden, get token. Simic Growth Chamber, returning Khalni Garden, Primeval Titan. Search for Boros Garrison + Slayers’ Stronghold. Tap Garrison for WR, then activate Stronghold targeting Titan. Return Stronghold/Mine with Garrison. Gemstone Mine, Khalni Garden, get token. DO NOT TAP THEM FOR MANA YET! Attack with Titan. Search for Vesuva (copying Boros Garrison) + Sunhome, Fortress of the Legion. Tap Mine, Garden and Vesuva for WRGG, activate Sunhome to give Titan double strike. Return any land with Garrison. Simic Growth Chamber, returning Gemstone Mine, Primeval Titan. Search for Boros Garrison + Slayers’ Stronghold. Tap Garrison for WR, then activate Stronghold targeting Titan. Return Stronghold/Garden with Garrison. Attack with Titan. Search for Simic Growth Chamber + Tolaria West, return Tolaria West. DO NOT TAP GROWTH CHAMBER FOR MANA YET! 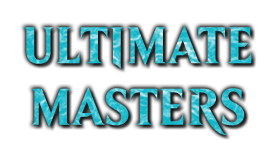 In your second main phase, tap Simic Growth Chamber and Gemstone Mine for UUG, then transmute Tolaria West for the Pact of your choice. You still have one land drop after this, use it however you wish. Attack with Titan. Search for Radiant Fountain + Khalni Garden. Alternatively you can search for Radiant Fountain + bounceland, return Fountain, then play it again in your second main phase. Key lesson: Maximizing one-turn mana production. Pacting for Azusa. Gemstone Mine, Simic Growth Chamber returning Mine. Tap both Growth Chambers to pay for Pact. Simic Growth Chamber, tap for UG, return itself, Primeval Titan. On turn 2 after casting Azusa, you can cast Serum Visions/Ancient Stirrings, or transmute Tolaria West for value using the next two lands played off Azusa. You also can play two non-bouncelands instead, just be sure to have enough to pay for Pact! Key lesson: Sandbagging bouncelands with Amulet. Tendo Ice Bridge, Amulet of Vigor. Tap Tendo Ice Bridge for 1. Simic Growth Chamber, tap for UG, return itself, Azusa. Simic Growth Chamber, tap for UG, return Bridge, Primeval Titan. This sequence gets Titan out with only one bounceland. Tap both Tendo Ice Bridges for 2. 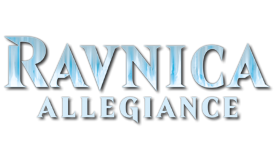 Simic Growth Chamber, tap for UUGG, return a Bridge, Primeval Titan. Key lesson: Chaining Titan into Titan with two Amulets. Overwhelming your opponent if you have the opportunity to draw such an AWESOME HAND! Tap Mine for mana, Amulet of Vigor. Simic Growth Chamber, tap for UUGG, return itself, Summer Bloom. Simic Growth Chamber, tap for UUGG, return itself, Primeval Titan. Search for Simic Growth Chamber + Tolaria West. Tap Growth Chamber and Tolaria West twice each for mana, then bounce Tolaria West. Transmute Tolaria West for Summoner’s Pact. Pact for Titan. Simic Growth Chamber, tap for UUGG, return anything, Primeval Titan. Search for Boros Garrison + Slayers’ Stronghold. Tap Garrison for mana twice (WWRR), then activate Stronghold on each Titan. Bounce Stronghold with Garrison. Attack with both Titans. Search for Sunhome, Fortress of the Legion and any other lands to activate it (bounceland, Gemstone Mine or Tendo Ice Bridge), and use Sunhome to give one of your Titans double strike. That’s 24 damage on turn 2, by the way. Oh, and you still have an extra land drop to use on your second main phase. Fun. Zoo, Burn: Aggro decks without disruption are practically beaten by the time you resolve Primeval Titan. Titan is too big to attack or burn through and you can tutor Radiant Fountain + Khalni Garden, followed by bouncelands to return & replay life-gaining lands, or Vesuva to copy them. Jund, UWR: You have inevitability against these decks. Although they have disruption (discard, counterspells), you have a lot of live topdecks. Furthermore, if Titan resolves (i.e. their “disruption” was in the form of removal spells), you can tutor Simic Growth Chamber + Tolaria West and transmute for a Pact to blank their removal. Twin: Pre-board their combo pieces (Pestermite & Deceiver Exarch) actually disrupt you, and post-board they have Blood Moon. Living End: They have a lot of land hate main (Fulminator Mage, Avalanche Riders, Beast Within), and Living End gets rid of Primeval Titan. GW Death & Taxes: Not only does it have Ghost Quarter, it also packs Leonin Arbiter and Aven Mindcensor, shutting down your tutoring ability. Path to Exile also ruins your day (most other decks play things like Lightning Bolt, which can’t handle Titan). 1) Is the opposing deck fast? 2) Does the opposing deck have disruption? If the answers to these questions are “yes/no” or “no/yes” then sideboarding is straightforward. Against fast decks without disruption, take out Hive Mind & Pact of Negation. Against slow decks with disruption, take out Radiant Fountain and Simian Spirit Guide. After removing the obvious “do-nothings” in a matchup, if you still need space, take out some Azusa/Ancient Stirrings/Simian Spirit Guide. Do not board out too many cards. Five or less is enough, perhaps more if you are bringing in some super-effective, practically-instawin cards e.g. Creeping Corrosion against Affinity. If you take out too many cards you end up losing to yourself because you couldn’t combo off in time. Thanks to Izzetmage for updating this primer and volunteering to keep it current! Leyline in sideboard or not? Sorry to put all those into 1 post, but they seem to be the most varying cards, and I can't work out which I like! I currently run leyline, don't run SSG or Posts, and just have 3 azusa. Am I wrong?!? I prefer leyline inboard as it makes ad nauseum and 8rack a better match but that is really a meta call. The stirrings vs guide id say is a toss up. I think stirrings adds some consistency to the deck that it does need. 3 azusa is the right number imo. I prefer the kabira + khalni pair over the glimerpost. i dont think glimmerpost really adds anything. Re leyline, I remember when I was playing living end we described them as training wheels. They are very good at what they do but when your mulliganing for them you will generally be keeping lackluster hands. My opinion is if you have lots of discard in your meta they are a good choice, Otherwise the 3-4 spots can be put to better use. I've been hearing good things about obstinate baloth as its good vs discard and aggro/burn. Does anybody know the decklist? I haven't played this MU (from either side) but keep in mind that you can transmute Tolaria West for Pact of Negation (from Titan's ETB or attack trigger) to disrupt them. Postboard you want to bring in Seal of Primordium (since it can blow up Moon and Ascension), Bojuka Bog (removing Kabira Crossroads for it) and Chalice of the Void (remove Hive Mind; a 6-mana Hive Mind doesn't win immediately while a 4-mana Chalice does). Leyline is not that good against Storm because they can win with Empty the Warrens too. On that note, Pyroclasm can replace Slaughter Pact. From the perspective of the Storm player, he might side Warrens since it's good against Pact of Negation (if he has an Electromancer and a whole bunch of rituals in hand, he can afford to let one of them get countered) and doesn't use the graveyard. You might be able to get a T2/3 Titan with Bog/Pact backup but he can Storm into Warrens for a bunch and race you - this is a credible threat, especially if you used Summoner's Pact to get Titan, because it ties up your mana for the next turn. Storm can fight through a Chalice on 2 but it's like Amulet trying to fight through a Blood Moon. If they land a PA (before Chalice) and get two counters on it, they can cast their rituals and Echoing Truth normally (the original gets countered but Chalice doesn't stop the copies). With regards to stopping Storm, they have 2 engines: PA and Mancer + Past. PA is basically unstoppable when it becomes active; countering doesn't stop quest counters from being added to it. Against Mancer + Past, wait until they try to cast Past - it's their "reset button", the one that renews all their resources. Agree with what everyone has said here, storm is rough. The slight benefit we have, is that many players still don't know our deck that well. You may durdle along and play nothing, and the storm player will take their time (unless they've probe-ed us). I've gotten away with a turn 4 hivemind on the draw against storm before. However, once someone knows what you're doing, you're in trouble! I think the race in g1 is simply who wins the dice roll. It's pretty 50/50 (maybe 55/45 in their favour). They're slightly more consistent than us, but we are as quick when it goes to plan. I do think the hive-mind hand is better though, because it wins, whereas a titan just puts them on 12. But, game 2 & 3, its turned from 50/50 to 70/30. They're still quick, but they have blood moon. I played a guy who pyrite ritual-ed a blood moon on t2, and that was curtains. Chalice will rarely come out that quick, and it's only a 1-of in most sideboards. I have recently moved to Mathais Hunt's list, with SSGs and Glimmerposts. I have to say, it does make us quicker - probably by about 1/2 a turn. The Glimmerpost being untapped isn't entirely irrelevant (if you play T1 gemstone and topdeck glimmerpost, it can allow a summer bloom that would otherwise be a turn 3). And SSG can turn a sluggish 5-mana hand into something a bit better (usually the azusa hands like SSG, summer bloom hands dont). With that in mind, the 1/2 turn is relevant in these races with storm etc. It's less relevant against midrange decks, and even worse against control. In my short experience with SSG - i would suggest this. If you expect control / midrange, play stirrings / khalni gardens / kabira crossroads. If you expect combo - play SSG and glimmerpost. I was dead set against the SSG change for quite some time, simply because I liked digging deep. But amulet isn't the key, summer bloom is - and stirrings doesn't find it. I've been looking for a replacement, and just decided to try SSG. And I like it! I'm going to keep it that way for now. In testing, I'm destroying a kiki-pod deck (about 6 matches to 1 after boarding etc). My previous record was worse, because the 1/2 turn was making a difference! The good hands, have always been good. An SSG won't make the summer bloom hand that much more explosive (no-amulet, summer bloom makes a t3 titan - ssg does nothing here). What it will do, is help when you're waiting on some acceleration off the top. Stirrings off the top is still slow, because you'll dig 5 deep to find a mana, but you spent mana doing that. If you had an amulet in play though, the stirrings just needs to find a bounce land and it'll be equivalent to SSG again - misses a bounceland, and it's worse. So, there's a lot of restrictions making SSG only good in certain scenarios. It can be a dead draw. The deck isn't consistently a turn faster now, its just faster some of the time. Hope that clarifies! An example I had just yesterday - I had 4 mana in play, 1 in hand (gemstone) and no amulet. I had a titan in hand and a serum vision. I played the vision, and drew a summer bloom (doh). Looking at the top 2, I saw SSG and azusa. The Azusa would do nothing, i've no land to play and already have a bloom in hand. The SSG though - turned my 5 mana into 6 and so stayed on top. Had that SSG been a stirrings however, the stirrings would have been tossed to the bottom, because it wouldn't make me 6 mana the next turn (had no amulet either). So SSG made me a turn quicker. Edit: chalice of the void is powerful (I play 4x in legacy and can give you free wins). The key is knowing the meta and what to set it at before you play it. In legacy this is easy as you'll generally never need higher than a chalice on 2. I think we need a list of what to set chalice against the main decks of legacy. From my experience its 0 against affinity 80% of the time and 100% when on the play. Kanister - yes the SSG is situational and sometimes it doesnt even give you a speed boost (topdecked as an example). Stirrings certainly allows you to dig, but not always for what you want. As for matchups with SSG (you rightly mention storm/ad neasuem etc), I do think SSG is relevant when racing. In a combo-heavy meta (or against RDWs and affinity), SSG is good. You can race them a bit easier. In control/midrange, stirrings seems better. I wouldn't rule out either. Often I found myself siding out stirrings for hate cards, so game 2-3 will probably follow suite - out comes SSG if you run that! Peer Through Depths seems a valid suggestion, as it can also find pacts. Has anyone tried it? Did anyone try see beyond? I had it for a little while, and occasionally was useful for shuffling annoying lands back into your deck. I think turn 2 search / draw is a little sketchy though! See Beyond is overcosted. Practically the only time you should play it is when you have a combo deck that has certain cards that must be in the deck instead of your hand to work (e.g. Dragonstorm - Hellkites must be in the deck so that they can be tutored). This isn't one of those decks. Standard cantrip package for combo decks is Serum Visions + Sleight of Hand (Storm and Ad Nauseam play those). However, this deck is a little different because it has Ancient Stirrings instead of Sleight. What makes "look at the top 5" cards like Stirrings work is a critical mass of cards that you can find with it - we have 27 lands and 4 Amulets, so it's quite hard to whiff completely. When you compare Peer Through Depths to Ancient Stirrings, it doesn't look that impressive. Peer costs an additional mana and has fewer targets, making it much more likely that you spend 2 mana and a card to do absolutely nothing. While it does get Pacts, we already have Tolaria West for that. 1) how expensive is this deck? 2) how's the pod matchup? I wont be playing it, but I'm interested in building 'stapleless' decks for beginners, poor people or somebody who just couldn't afford playing both T2 and Modern. I really wish they would have printed a new shade. Nantuko shade seems kind of overcosted, or has too many colored mana symbols on it. 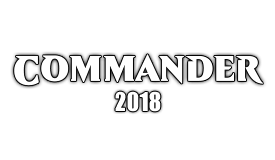 I believe WoTC's new policy is to make sure that every color can enjoy the exciting gameplay mechanic of making undercosted dudes and then turning them sideways. Clearly the future of magic. Podríamos hacer un topic donde marquemos los peores horrores de ortografía. I estimate a full-powered version of this deck will go for $300-400. A budget version would be half of that. Lastly I do NOT recommend this deck for beginners unless they are absolutely committed to playing it. This deck is complicated (I'm not saying that just to make myself look smart) - there are all sorts of things that you have to learn like land sequencing, stacking triggers, and tutor targets. Honestly, the reward for learning all that is not high. If someone gives up on this deck halfway, they're stuck with a bunch of cards that have no use outside of it. thanks for the imputs, guys!